When Tiff was in town (sighs, wipes away single tear), we went to the Rose Bowl Flea. It’s a wonderland, full of antiques, rough-looking sunburns, teenage girls screaming at their mothers, and air plant vendors. What I didn’t expect, was to find Eileen Fisher there. Not actually Eileen, like the person, but to my absolute delight, Fisher Found had a booth at the market. So, I didn’t know about Fisher Found, maybe because they used to go by Green Eileen, but probably because I don’t know about cool stuff like I used to. Anyway, Fisher Found is amazing, and it’s the place to find used Eileen Fisher stuff for way less than ticket price. I want to also take a second to say yeah, I love Eileen Fisher. The company has set the standard for what it means to be a sustainable, ethical brand, and was doing it before it was cool, and before anyone asked it of them. They just see it as the right way to do business, and I think that’s awesome. Also, I used to think of Eileen Fisher as a brand that my mom would wear, and that I would not. Turns out, my mom has pretty good taste, and just how I have grown into stealing her music, her old purses, and her recipes, I am jumping on this train too. Fisher makes the best, softest basics, and the few pieces that I have, I wear to death. The site is searchable by type of clothing, and because it’s all pre-worn, renewed, and remade, there is just one piece of each. It’s a lot like digging through piles at the flea market, but it doesn’t smell like dust and fish, and you won’t have to fight off strangers for your favorite piece. Unless that stranger is me. Hope you like it as much as I do! My birthday is in two days. Categories: by cait, Ethical fashion, sustainable fashion, treasurehunt, USA | Tags: Eileen Fisher, Fisher Found | Permalink. A year ago today, I was in a car with my parents on the way to Kep. I was exhausted, because the day before, I had put on my first fashion show. I think it took me a while after the show to figure out how I felt. I know this, because people kept asking me, and I would just stare into the distance and say “good, really good.” Lies. Nothing profound came to me because it was the beginning, and no one ever realizes what is happening at the beginning. I do, however, remember everything that went wrong with the show. Every stupid detail. One of the models didn’t even walk because the dress was re-fitted too many times and I tried to save it but I couldn’t. A few of the dresses that were dyed turned out too light, and I hated the sad-lavender color that I couldn’t change. One of the dresses ripped before the show. The makeup took longer than we thought so we didn’t have time for a proper run-through before the show and no one got touch-ups before walking. I really wanted all the models to be comfortable so I ended up designing things more for them and less for me. One of the shirts was made with a neckline so small, the model had to take out her hair, that had just been done, and wiggle her way into it. There weren’t enough drink tickets. At one point, the damn DJ came down to the runway DURING the show to take photos for himself, and missed the cue for the finale. He only came back up to his booth after seeing my head explode with expletives. He had one job. One. Job. I said bad words really loudly. I wanted to include more people but I was worried that the venue was too small so I had to say no to people when they wanted to come support me. I remember being sweaty, and chugging champagne, hoping it would take hold of my brain, or at least take care of the nerves. I remember being mad at the champagne when it did neither. One of my lovely model/friends did a little toast for me before the show, and it was probably very sweet. I, of course, don’t remember anything she said, because I was SO not in the moment and instead, running through all the scenarios where everything went wrong and someone caught on fire and died and everyone hated the clothes and Anna Wintour was there and said “you will NEVER make it in fashion” in front of all of my friends who by then, of course, hated me. None of those things happened, but welcome to how anxiety feels. The entire night I felt an inch away from tears, and it was exhausting. Fashion is so glamorous. I did cry when my dad gave a speech at the end of the show, in front of everyone. It was a happy cry, and my heart still fills up when I think of it. I cried when I saw Tiff walk, because she was the person that pushed me into designing, and had an incredible amount of faith in me when I deserved none of it. I also cried when my mom walked, because it was my MOM and she was walking in my fashion show and how do you not cry? And…I might be crying now, whatever. Mind your business. In any case, I really didn’t enjoy the show. But I am SO glad I did it. I was scared of it and had no idea what the power of vulnerability would do for me. Putting things out into the world to be judged has never been something I am comfortable with. I even tried to bribe my high school english teacher with two papers, so I wouldn’t have to present in front of the class. When we started the blog, I would tear through every piece I put up, scared that someone might see it and scoff. I’m sure that happens, it just doesn’t actually matter. But I would have never gotten to the place I am now, on my couch in LA, if I hadn’t done the show. The show made me a designer, for real. I designed a collection, my friends walked a runway lined with fake candles, and we had photoshoots and made a damn look book. How legit is a look book? So legit. So I am thankful for the whole experience of the show. Would I change things? Of course, there was no world where I was going to walk out of the door and make it perfect. But it’s a place to grow from, and I like my cozy little starting point. It was kind, full of people I love, and I got free french fries afterwords. Honestly, I wouldn’t have wanted it to be perfect. I can’t handle the pressure of constantly creating perfection, I’m not Adele. If you want to see photos from the show, they are here, here, and here. I will always be grateful that my messy little show was full of so many incredible ladies. Thanks, guys. Categories: by cait, design by cait, Ethical fashion, prettyshit, process, thefeels | Permalink. It has been a long, long time since I have felt chilly. Not air-conditioning on the couch chilly, but brisk-outside, wearing flannel and drinking tea chilly. Today, in sunny LA, it is overcast, 68F (20C, for Tiff) and this coffee shop is playing throwback Joni Mitchell. I get that 68F isn’t exactly the end of days, but for someone who has been pining for sweater weather for the last five years, I am enjoying the hell out of it. Naturally, this moment of coziness has led me to internet dive into sweaters, scarves, and jackets that I will live in for the next few months, even when it’s inappropriate. The thing is, I don’t exactly have a “closet” to put sweaters in, or an “apartment” to live in, so until I have a permanent place to put myself, these are all dream cozy pieces. Because I care about not destroying the world with my choices (#VOTE), I am looking at eco-friendly, sustainably-made options. Enjoy the coziness, even if it’s virtual. Categories: Ethical fashion, North America, sustainable fashion | Tags: chilly-ish, cozy, NAU, patagonia, people tree, Prana, Stella McCartney, studio 189, study NY, zady | Permalink. Angkor Necklace and Turning Leaf Bracelet by Khmer Creations available through Penh Lane. 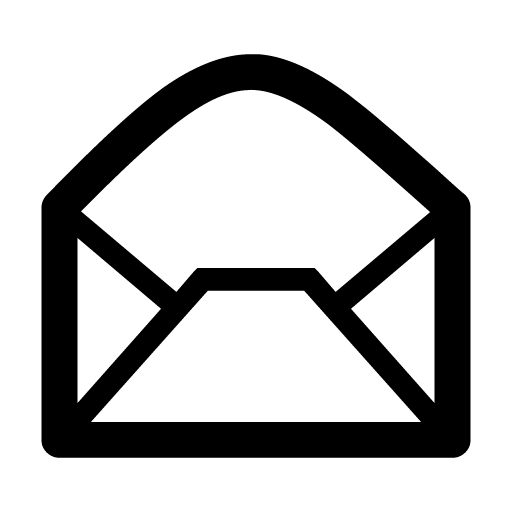 Eventually you figure things out, and that relationship with your very patient client grows into something awesome. So I wanted to give a shoutout today to a client who first came to me out of nowhere to me last year. 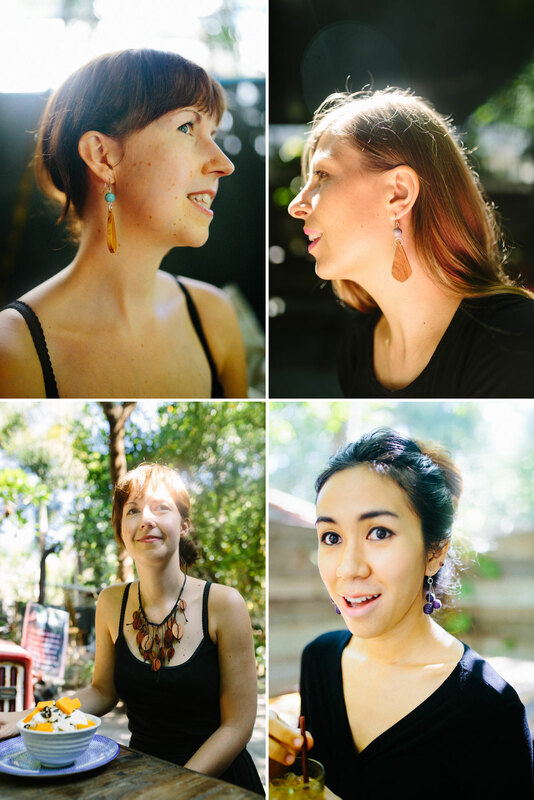 Khmer Creations Jewellery Studio was first founded by one, two and then three ladies. Antonia and Jane, who are from Australia, joined forces with Samnang to create a social business that provides income generation for women in vulnerable communities in Cambodia, and has since grown to become an all-female, locally managed jewellery design and production studio that now exports its products to Europe, North America and Australia. Women from low-income and vulnerable communities in the Phnom Penh area are provided with an income matched to the local living wages, as well as health insurance and a safe workplace. Not only that, but they’re also educated and equipped with skills in financial literacy and personal development. They’ve even got a savings and loan group going on inside Khmer Creations. Some are single moms, and Khmer Creations even has a day-care to make sure that the cutest bubs are taken care of. Penh Lane came around shortly after as a trading company that not only works with Khmer Creations, but also four other Cambodian social businesses to design, wholesale and retail jewellery and other accessories to markets around the world. Over the past few weeks I’ve been taking editorial shots for Penh Lane, featuring models of my choosing. I picked my lady lifting buddies from Crossfit Amatak because they are a joy to work out with. Rebekah has an infectious smile even during the toughest of workouts, Julia is always amazing conversation in between the burpees and Lyda can lift a mighty mass and look fabulous at the same time. I knew they’d look great in Khmer Creations’ goodies. 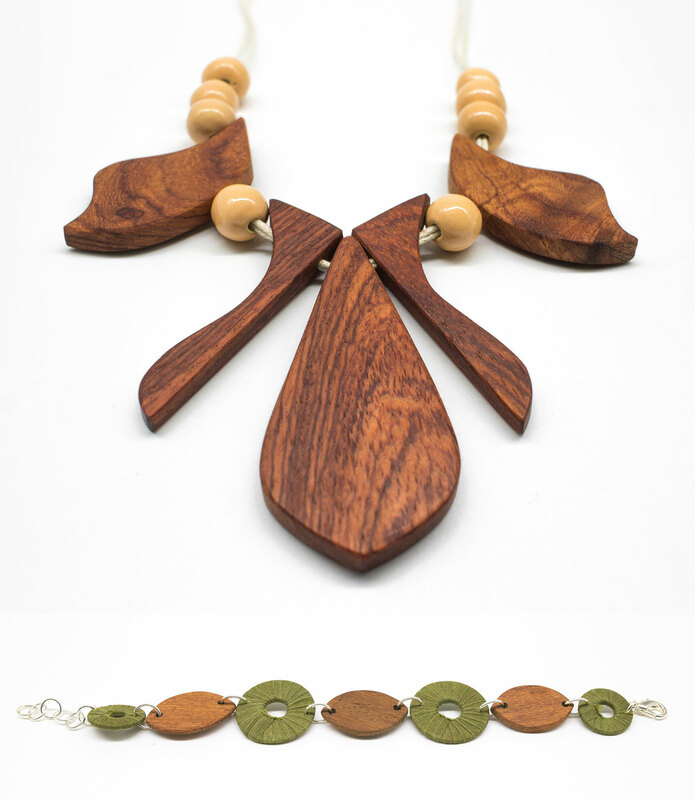 Upper: Angkor Earrings, Lower: DeVine Recycled Timber Necklace (left) and Cotton Bead Earrings (right). All by Khmer Creations. Samnang Button Necklace and Seripeap Ceramic Bead Earrings (bottom) by Khmer Creations. 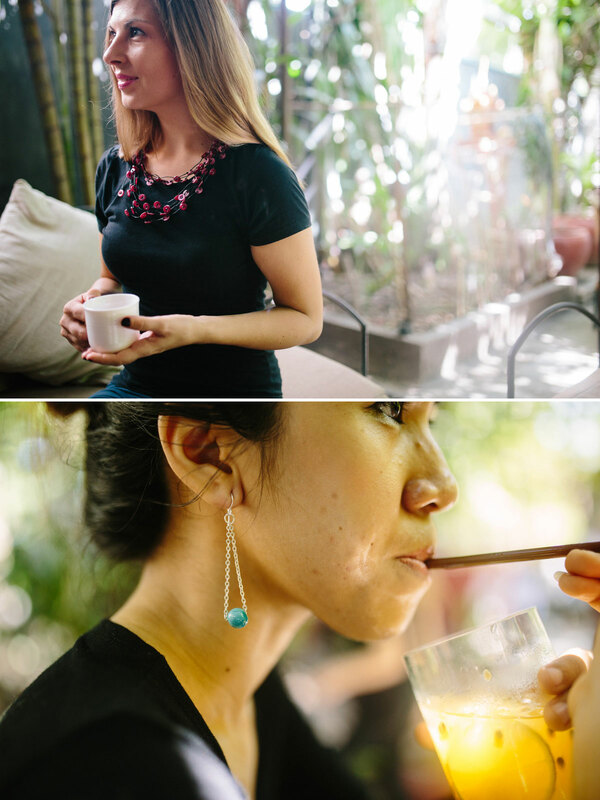 I also got to shoot a couple of the gorgeous ladies that work at Khmer Creations Jewellery Studio. Which was just so much fun and a big lesson in directing a shoot with my could-definitely-be-better Khmer language skills and with Samnang as my translator. Khmer Creations’ Turning Leaf Necklace and Original Cotton Bead Necklace. So I’m beyond thankful to Khmer Creations and Penh Lane for supporting me and my growing skills. I can’t wait to work with you guys again! Find Penh Lane and Khmer Creations products online and at local stockists! If you’re in Phnom Penh, you can find the goodies at Lot369, Teahouse Asian Urban Hotel, the Watthan Artisans shop on Street 240 and at Aeon Mall! A big huge thanks to Farm to Table for letting me run around your beautiful green space! All photos by Tiffany Tsang for Khmer Creations. Please request permission to use. We are not liable for any accessories shopping binges. Categories: Ethical fashion, local business, makers, photos by tiff | Tags: Cambodian social businesses, client love, Ethical fashion, Khmer Creations, Penh Lane, sustainable fashion | Permalink.